One more reason why Sambhaji was often harshly judged by historians was his rather rash behavior that alienated some of the more powerful Maratha clans. In a sense Sambhaji had to bear the burden of his father’s legacy, and it did not help that there was no love lost between em.
. But it would be unfair to dismiss Sambhaji’s contribution to the Maratha Empire, in his own way he strengthened it, and carried on the good work of his father. It was not an easy childhood for Sambhaji, born to Sivaji’s first wife Saibai, whom he also loved the most. He lost his mother at the age of 2, and grew up in the care of his grandmother Jijabai. When he was just 9, he was forced to live with Raja Jai Singh of Amber as a hostage, following the Treaty of Purandar, which Sivaji had signed in 1656. For some time, Sambhaji had to serve in the Mughal Court under Aurangzeb, and on May 1666, he was placed under house arrest along with his father. They managed to escape, hoodwinking the guards, hiding in fruit baskets. Sambhaji was married to Jivabai, the daughter of Pilajirao Shirke, a powerful deshmukh of the Konkan region, and she changed her name to Yesubai after marriage. It was more of a political alliance, with the marriage giving Sivaji access to the entire Konkan region. However Sivaji never really got along with his son, and for some time Sambhaji was put under surveillance in Panhala fort to curb his irresponsible behavior. Sambhaji escaped from there, and for some time, served with the Mughals before coming back to the Maratha camp. 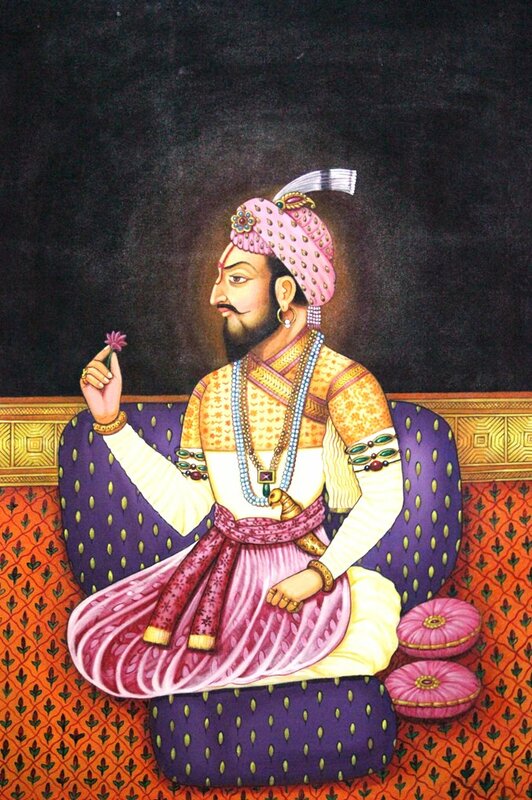 Shivaji passed away in 1680 leading to a bitter struggle for the accession to the throne. Sambhaji’s step mother Soyrabai, wanted her son Rajaram to be the next ruler, and she connived with various Maratha nobles to install him on throne. Sambhaji escaped from Panhala, and overthrow Rajaram, after taking control of both Panhala and Raigad forts. He was formally crowned the emperor on July 20, 1680 and threw Rajaram, Soyrabai along with Rajaram’s wife Jankibai into prison. Got Soyrabai executed on treason charges. One of Sambhaji’s first campaigns was against Burhanpur (currently in Madhya Pradesh), and a stronghold of the Mughals. Known for its riches as also its grand buildings, Burhanpur was an obvious target for the Marathas. And soon the city was captured, the treasury was looted, and the captives were executed. In 1681, Sambhaji gave shelter to Aurangzeb’s rebellious son Prince Akbar, it would lead to one of the longest wars in Indian history between the Marathas and Mughals. Aurangzeb already furious over Sivaji checking his advances in the Deccan, now swore to destroy the Marathas forever. After camping in Aurangabad, the Mughal Headquarters in the Deccan, Aurangzeb turned his attention to the Marathas. Aurangzeb was able to overcome Bijapur and Golkonda, bringing to an end the Adilshahi and Qutubshahi Empires there and also got two great generals Murrabkhan and Sarjakhan. One of Sambhaji’s failed campaigns though would be against the Siddis of Janjira, against whom he led a 30 day siege in 1682. It was a fort even his father failed to capture in spite of an intense campaign. Though Janjira was subjected to attack and suffered heavy damages, the Marathas could not penetrate the fort. Sambhaji attempted a Trojan horse style trick, sending in his own men as defectors, however the plot was discovered, and the infiltrators executed.
. Sambhaji attempted to build a stone causeway to the island, but had to give it up when Aurangzeb attacked Raigad, forcing him to retreat. Sambhaji however managed to capture the Portuguese held fort of Anjadiva but the Marathas were later repelled by a 200 strong force. This led to another ongoing conflict between the Marathas and Portuguese who at that time, were allowing the Mughals to use their ports as also, provided regular supplies to them. And to make matters worse, the Shirke clan who had defected to the Mughal side, spied on his movements, as he was on the run. Sambhaji was taken prisoner by the Mughals under Muqqarab Khan in February 1689, along with his friend Kavi Kalash. Taken to Tulapur, Sambhaji along with Kavi Kalash, was humiliated in the worst possible manner, by Aurangzeb, first they were made to dress like jokers, insulted, paraded in chains and laughed at. His skin was peeled off using the Bagh Nakh(tiger claws), he was blinded, his tongue was plucked out and nails pulled out. Finally on March 11, 1689, Sambhaji was executed, by beheading him at Tulapur and his body thrown into the Bhima River. March 11, 1689- The day Chattrapati Sambhaji gave up his life for the sake of Hindu Dharma. Tortured in the worst possible manner, yet he never gave up his faith. #Naman to this hero and great son of Bharat, who unfortunately never got his due. The fact is that Sambaji had managed to keep the Maratha Empire intact, and carried on with most of his father’s policies. His death threw the empire into a period of chaos and confusion, and it was only the ascent of Chattrapati Shahu, his son that bought it back to glory. On this date take time to remember Chattrapati Sambhaji Maharaj, who sacrificed his life for the sake of Hindu Dharma. A true hero and warrior, who deserves more recognition. #Naman to an often unfairly maligned hero. Though Aurangzeb managed to torture and execute Sambhaji, in the long run, he lost the battle to the Marathas. And his downfall was in the hand of two remarkable ladies- Keladi Chenamma and Tarabai, the widow of Sambhaji's brother Rajaram. When Rajaram was fleeing the Mughals, it was Keladi Chenamma who gave him refuge, and beat back the Mughal Army. And later after Rajaram's death, it was Tarabai, who led a spirited campaign, made Aurangzeb retreat. #Naman to these 2 ladies, true epitome of Shakti. Aurangzeb died a lonely and broken man, his Maratha campaign was a disaster, exhausted the Mughal treasury, and led to their eventual downfall. Sambhaji Maharaj's supreme sacrifice for the cause of Hindu Dharma did not go in vain. Reason why we need to remember him. Today is the Punya Thithi of Nana Fadnavis, the Maratha Chanakya. t. As Prime Minister of the Maratha confederacy, he bought it back to the days of glory after the humiliating rout at Panipat. One of the most famous residents of Wai. Nana Phadnavis,the secretary to Sadashiv Rao Bhau, one of the few who survived the carnage at Panipat. A man who defeated the British twice with his intelligence and diplomacy, prompting them to call him the Maratha Machiavelli. This remarkable genius was born as Balaji Janardhan Bhanu in Satara district, Nana was his nickname. His grandfather Balaji Bhanu had migrated from the seaside town of Shrivardhan, in the Konkan region, and was a close friend of the first Peshwa Balaji Vishwanath Bhat. #TodayInHistory The #WorldWideWeb comes into being. This was the date on which Tim Berners Lee actually made his proposal for the Web, it would take some more time for it go live. And there are many other phases too. While The Web and Internet are often used interchangeably, fact is the Web is any other service like email, that is used over the Net. Internet's history dates back much earlier than the Web's, and the Web's development is just a part of it. Matter of fact much before the Web, there were other applications in the Hypertext space- Memex by Vannevar Bush, IBM's Generalized Markup Language, and Project Xanadu by Ted Nelson. The last in fact claimed theirs to be an improvement over the Web. Wishing all an auspicious #Mahashivratri , may blessings of Mahadeva be with you all. On this occasion taking a look at some famous Shiva Temples in Andhra Pradesh and Telangana. What does one say of a language and a region, that takes it’s name from a belief that Shiva descended on three mountains there? The ancient name of the Telugu states is Trilinga Desa, meaning the “Land of the 3 Lingas”. It's believed Telugu gets it's name from this too. It’s believed that Shiva descended in the form of 3 Lingas located at Kaleswaram in Telangana, Srisailam in Rayalaseema and Draksharamam in Coastal Andhra, which made up the Trilinga Desa. The belief apart both the Telugu states have had a close connect with Shaivism. Folks, yesterday was the 330th martyrdom anniversary of Sambhaji Maharaj. Replugging an old series on him. #Sambhaji Bhonsle was the once estranged elder son of Shivaji who ascended to the Maratha throne after his death, in Jul 1680. This was in the middle of the Mughal - Maratha war. #Sambhaji carried on his father's war with renewed vigour and zeal. In the process, #Sambhaji inflicted serious defeats on Aurangzeb's army in a cycle of death and destruction. In 1689, however, his fortunes took a turn for the worse. Conversion was integral part of all Muslim invasions. #Aurangzeb was worst of all Mughal rascals who invaded India or were their progenies. When he killed Guru Tegh Bahadur, Bhai Mati Das, Bhai Sati Das and many more, conversion to Islam was common condition put by rascal. Many morons who have written books on #Aurangzeb try to portray him as a benevolent ruler who used to make earning by sewing caps, writing Quran's copies and what not. Reality is, this rascal massacred millions of Hindus,converted millions to Islam & desecrated countless temples. As always, yeah, I can back-up those words with hard evidence. Short THREAD. In my 2017 biography of Aurangzeb Alamgir, I peg the king as a 'Destroyer of Temples' at times. Seriously, that's a title of a chapter in my book on the king. I describe in unvarnished language how he brought down certain temples. 2/n Of all the Mughal Emperors who preceded & succeeded him,he was most adherent Islamist,Sharia Practioner as well as most instrumental of causing conversations. For that was a cause to inch closer to be s better Muslim. 3/n The Holy Quran has been thru various corruptions at hands of various Muhammad Haters who subscribed to Islam post Prophet’s death. The corruption has left the Holy book with ambiguity & more ambiguity. If (2.256) of book forbids forced conversion, (9:5) reflects diff view.